As guitarist for Eagles Of Death Metal, Queens Of The Stone Age and Masters Of Reality - not to mention owner of California's legendary Rancho de la Luna studio - Dave Catching knows his pedals, so it's worth taking note of this collaboration with Dr. No: the RoadRunner Octave Fuzz Wah Flying Machina. 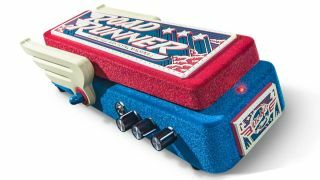 An old-school fuzz wah Octavia with high-end components, the RoadRunner offers volume, intensity and fuzz knobs, with octave on/off switch and three wah capacitor options - Dr. No claims the housing's red and blue 'Flock' creates a peach-skin feel and look, too… Intriguing. Following November's terrorist attacks at an Eagles Of Death Metal gig in Paris, Dr. No and Dave will donate the profits of RoadRunner sales up to 31 December to victims of the attacks via the Sweet Stuff Foundation. The RoadRunner Octave Fuzz Wah Flying Machina is available now from Dr. No Effects for $368.85 (£247/€335).